Dorset Sensory Room Installation at Chewton Common Playgroup. 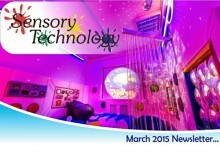 This new Sensory Room has been designed to create a fantastic environment for the children to enjoy. Whether they are looking to have a relaxing or stimulating experience. 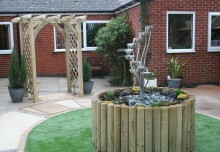 We have installed a range of products that will provide the children with some wonderful effects. In the corner of the room we installed our very popular and amazing Borealis Tube. This LED driven no -maintenance light tube has 16 different light sequences. These never fail to fascinate and captivate the children. Acrylic mirrors have been positioned behind the Borealis Tube to also maximise it’s effect. 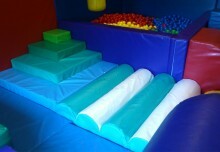 To activate the tube we have included within the install our interactive Soft Play Cube. The children can roll the cube and whichever colour lands on top determines the colour glow. This makes for a great cause and effect product. To theme the room, we have included our Solar Projector. The two theme effects wheels the playgroup choose were ‘space’ and ‘under the water’. Many other themes are available and can be easily swapped to create an ever-changing room. No sensory room is complete without a Mirror Ball. It produces a wonderful array of colour changing spots that dance around the room. On the wall we installed our new Infinity Tunnel. This tunnel is very interactive and colour changes for the children via the four way hand switch we supplied. This adds so much more fun as it enables them to take control of the colours and effects for themselves. 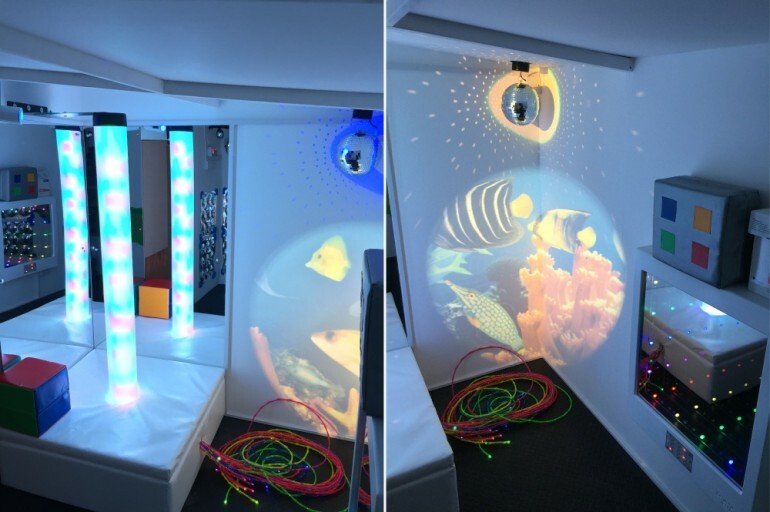 Finally, at this Dorset Sensory Room Installation in Chewton Common Playgroup we fitted through the Borealis plinth a UV Bamboo Fibre Optic Harness. This gives the children a tactile effect in the room which will fluoresce brightly under the UV light. All of the products in the room have been wired back to one central location for easy control of the system. The supervisor can select which products they would like on for each session. For details on Chewton Common Playgroup, checkout their website.